As we get into the colder months I always face the issue of the lack of winter clothing in my wardrobe, which gives me an excuse to go shopping, although to be honest, do you really need an excuse?. I thought I'd share with you a few of the lovely pieces (both clothing and beauty) I have my eye on this month. I love a good warm jumper in the winter months and this is no exception. But when it's a colour this gorgeous I challenge anyone to not fall in love with this jumper! Apart from the obvious dark red/purple shades, one nail look I love this time of year is neutral nails. I spend most of the summer months with fairly bright nails so I always like to really tone it down during autumn and winter. I saw this Essie shade in Boots yesterday and it was so hard to drag myself away from it so I could catch my train on time. I have a huge thing about my feet being in a good condition, so I'm always on the look out for a good product to help me do that. I've had my eye on heel genius for a while as soap and glory are one of my favourite brands and they always work wonders for my skin. I popped into Topshop last week and I immediately spotted this ring on the jewellery stand. It's a lovely little gold ring with your initial on it, and supposed to be a midi ring but i have the tiniest fingers in the world (even though i'm practically a giant - how does that work?) so it actually fits on my finger as a normal ring. I wanted to buy it there and then but sadly they didn't have a C, shame on you Topshop! They never seem to have a C on any of their initials products, does anyone else have this issue with their initial? I popped into the newly opened Benefit store on Carnaby Street in London yesterday and it is so lovely in there! I could have brought everything if my purse had allowed me to. I spent ages debating whether or not to purchase this mascara as although I have seen so many bloggers rave about how amazing it is, I wasn't sure I could pay around £20 for a mascara, so ! walked away. But you know when you regret something the minute you don't do it? I really wish I'd brought it now! I promise ! will next time. Autumn and Winter are all about infinity scarves for me. I own far too many but I love them. They're amazing at keeping you warm and they look so cute! This one is in a fabulous red shade that just screams autumn. I might just have to treat myself next time I'm in Topshop. I love military boots (or combat boots as they're called here - is it an American term?) and I live in my black Primark ones in Winter. When I saw these on the Forever 21 website I fell in love! I've never owned a brown pair before for some reason but I really want to! They're so practical and comfy, perfect for autumn walks, and I always find they look fab with a parka. 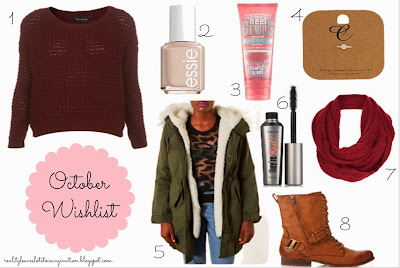 So those were the items on my October wishlist. Have you got any of them? Or are they also featured on your October wishlist? If you've done a post similar to this, leave me a link and i'll have a nosey!